ADA Instructors Desk - Phenolic Top 72x30"
The Solid Phenolic Top ADA Instructor's Desk by Diversified Woodcrafts is a supreme example of wood craftsmanship built upon a clear understanding of how science is used in the classroom. This accessible instructor's desk is constructed of solid oak with a tough work surface of phenolic resin, able to endure an endless amount of experiments. A roll-under sink rests in the instructor's desk, with a convenient paddle-handle faucet. A gas fixture and a duplex outlet are also well-situated for easy use in this workstation desk. The spacious worktop allows science equipment to be spread out and used efficiently and carefully. Knee space is roomy and wide enough for a wheel chair to fit. With integrally-joined cabinet parts, sturdy drawer suspensions, smooth drawer operation and comfortable hand grips, no detail is overlooked. 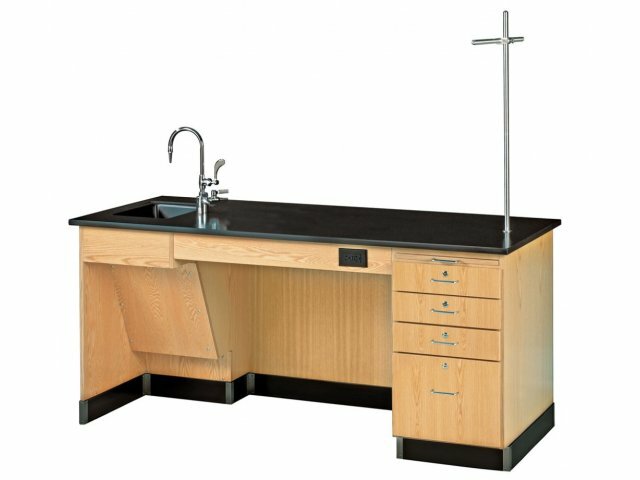 Designed in consultation with the National Science Teacher's Association, this instructor's desk is customized to address any and all safety concerns and meet all recommended standards. Quality Craftsmanship: Instructor's desk is made with modern precise technology and only high-quality materials. 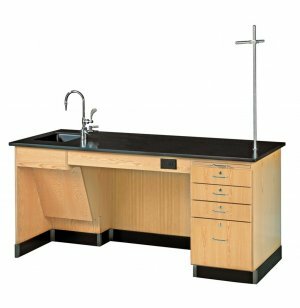 Safety Standards: Designed in conjunction with the National Science Teacher's Association, instructor's desk is compliant with recommended standards and safety concerns. The 34" height meets ADA requirements and the Greenlaw arm provides additional stability for lab equipment and science experiments. Earth Friendly Finished with a chemical resistant, earth-friendly UV finish. Durable: Built of solid oak and a resilient worktop of phenolic resin, desk will withstand tough use and science experiments without damage. Integrally-joined cabinet parts and sturdy drawer suspensions ensure long-lasting function. Convenience: A roll-under sink with paddle-handle faucet, gas fixture and duplex outlet, are all provided comfortably within reach. One file drawer and three small drawers run smoothly on epoxy-coated steel glides with nylon rollers. Also includes additional pull-out writing board.